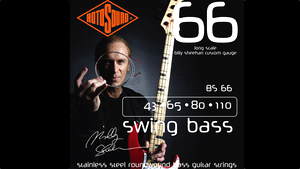 KitMonsters – Rotosound Billy Sheehan Signature Swing Bass Strings. The music makers’ guide to making music. Based on the stainless steel Roundwound strings introduced in 1962, they are known for their deep, melodic and resonant tone and great sustain. It is no surprise that they are the most popular Roundwound bass string ever. This custom signature set is using Billy Sheehan’s preferred 43-110 gauges.